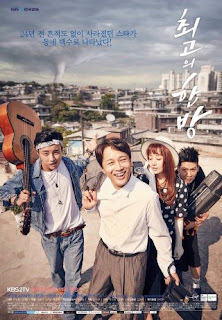 The Best Hit (Hangul: 최고의 한방; RR: Choigoui Hanbang; lit. Best Punch; a.k.a: Hit The Top) is a South Korean television series starring Yoon Shi-yoon, Lee Se-young, Kim Min-jae and Cha Tae-hyun. The drama airs on KBS2, every Friday and Saturday at 23:00 (KST) starting June 2, 2017. Plot: About the tumultuous lives of contemporary twenty somethings, as they worry and learn how to connect with people, how to love, and how to succeed in this harsh world.